Description: The tree is small to medium, to 20 or even 33 ft (6-10 m) high, with short trunk to 1 1/2 ft (45 cm) in diameter, and spreading branches, which are rusty woolly when young. The deciduous leaves are alternate, short-petioled, undulate, oblong-elliptic or oblong-lanceolate to oblongobovate, 8 to 12 in (20-30 cm) long and 4 to 5 1/2 in (1014 cm) wide, acuminate at the apex, brown-hairy on both surfaces and with prominent veins beneath. Strongscented flowers, which emerge with the new leaves, are solitary, fleshy, large, conical, usually enclosed at first by a pair of bracts; are held at the base by a rusty-hairy, 3 parted calyx, and have 3 very thick outer petals, brownhairy outside, yellowish and purple mottled within, and 3 smaller, thinner inner petals, creamy white outside, purple inside. 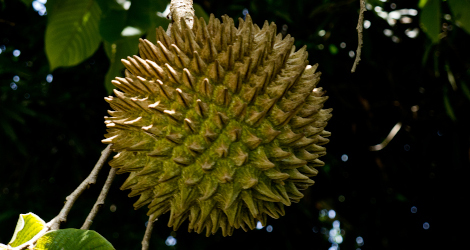 The fruit, thick stalked, is ovoid or nearly round, 6 to 8 in (15-20 cm) wide, set with hard, somewhat 4-sided, conical protuberances, each tipped with a curved hook, and is coated overall with a brown felt. The pulp is agreeably aromatic, suggesting the mango; abundant, yellow or orange, soft, fibrous, of mild, agreeable flavor. Seeds are numerous, ovate), and broadly tapering to each end; wider than oblanceolate. ">obovate, 1 to 1 3/16 in (2.5-3 cm) long, dark-brown, and each is enclosed in a thin, closefitting membrane. The fruit carpels separate easily when ripe. Uses: In Mexico, soncoya juice is regarded as a remedy for fever and chills. Elsewhere it is given to relieve jaundice (probably because of its color). The bark decoction is effective against dysentery and a tea of the inner bark is administered in cases of edema. The seed extract destroys fleas. In Guatemala and Costa Rica, rural people believe the fruit to be unwholesome. In Colombia, the pulp is eaten raw or is strained for juice, drunk as a beverage or folk remedy. CRFG Website. Last accessed on Thursday, May 18, 2017. Morton, J. 1987. Soncoya p. 85. In: Fruits of warm climates. Julia F. Morton, Miami, FL. via Purdue New Crops Website. Last accessed on Thursday, May 18, 2017. Image #00 (cropped) & #01 (original) by Ll1324 [CC0], from Wikimedia Commons. Last accessed Wednesday, 12 December, 2018.